Another quick and tasty crockpot meal! This one comes from here. Put the chicken, onion and peppers in the crockpot. I added my chicken frozen. Drain the can of pineapple. Set the pineapple chunks aside for later. Mix the juice with the rest of the ingredients and pour over the chicken. Cook on low for 7-9 hours or high for about 4-5 hours. A bit before serving add the pineapple chunks. We all really liked this. I will make this one again! Tiffany, this looks great. I have a funny feeling my fam will really like this one. Love your blog by the way, so inspiring! 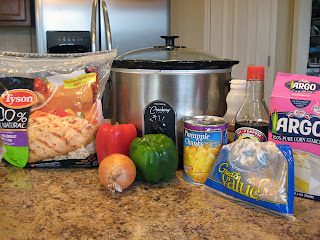 Oh, I love sweet and sour chicken, and this is the first crockpot recipe I’ve seen for it! I can’t wait to try this. I’m adding it to next week’s menu right now. I’m putting this on my list. I can do this easy. I love crockpot recipes. Sounds so yummy. This is soooo going on our menu! W-O-W!!! That looks really, really good. I luv sweet and sour chicken, but have never made it. I think I might just try your recipe tonight…thanks! Oh my! That looks so good. Thank you for stopping by my blog! I am so glad I was able to stop by here! You’ll definitely be a regular stop for me! Ooooh. That looks great. I’ve never seen a sweet and sour crockpot recipe before. Will definitely give this one a try. Wow, this looks good. We will definitely try this recipe. I found you on UBP 2009. I have put your blog on my reader. Great job!! It’s perfect timing that I came across this recipe. I tried a sweet and sour chicken recipe the other day using apricot preserves. I was not too happy with the end result. This recipe sounds like it’s definitely worth a try. I want to go the pineapple route this time! We love Chinese, and I’m always looking for crock pot recipes. This one looks like a winner! I made this today, it turned out awesome! The whole family loved it! WTG! I used 4 frozen chicken breast halves, 1 can of pineapple tidbits, green onions (I didn’t have any regular onions this am), green pepper, I continued with the recipe adding per your suggestion the ginger and garlic powder. An hour before we were to eat I chopped up the chicken breasts, they were juicy and tender! I had to add more corn starch when I added the drained pineapple as the sauce was soupy. I served it over rice, with chow mein noodles on top. Definitely a repeat recipe! Thank you! I take part in a “meal exchange” with 5 other women. Each month we each prepare 5 (plus one for ourselves) of the same meal to the point that they can be frozen (either in plastic bags or foil pans). Then on the first Thursday of each month we all meet up with our dishes in hand and exchange. We all walk away with 6 meals (including the one we made of course!) pretty well “done” except for the final cooking process (in some cases just warming through). Have been looking for some new ideas for the exchange and thought this recipe could possibly be adapted to work…suggestions???? if I find ‘storebrand’ frozen “Oriental style mixed veg” on supersale, I buy a bag or 2 to keep on hand. You can dump part of a bag in the slowcooker (still frozen) and still-frozen chicken, using the same recipe. With a ‘super deal’ on nuggets, you can do an even lazier version. I made this on Wednesday. Here were my modifications: fresh pineapple (about half of a small one), extra 1/4C water (since no juice from pineapple), accidentally 1/4C instead of the 2T of soy sauce, honey instead of brown sugar, I only had 1 orange pepper, 4 cloves garlic (minced) and 1/2 inch piece of ginger (grated, threw end “chunk” in there too). I served it over udon Japanese pasta. The flavor was pretty good, I think I should have used more ginger and garlic (I have plenty of both). But my chicken breasts turned out a little on the dry side. I put in 4 frozen and did it on high for 4 hours, then switched to “keep warm” because they looked like they were done, but I wasn’t ready to eat yet. About 20 min or so before eating, I added the pineapple and fresh sugar snap peas. So it was probably in the crockpot for 5 hours total. Now, I’m new to my crockpot (just a few years and I only use it zero to 2 times a week) and I’ve never been able to have chicken breasts be moist in there. Any advice? LadyLep, I like the sound of your recipe variations. I made this recently too and added some garlic, but no ginger. Ginger sounds good though. As far as the dry chicken, I think it comes from over cooking. I have the same trouble sometimes. Part of the trick is to be sure the crockpot is full of food. If it’s not full enough, it will over cook. Unfortunately, I only have a 6 qt, so not every recipe fills it up and sometimes I end up with over cooked food. I also think part of cooking with a crockpot is trial and error on the cooking times. Each slow cooker cooks a little different and it takes a while to get used to it. If you have a dish that will fit inside your crock, you can use that to “shrink” your slow cooker. OK, I had to read that last line a couple of times to understand it. 🙂 I never thought of that. I do have at least one glass casserole dish. But I’m not sure it would fit. I think I have a large crockpot, but not sure what size. It’s a Rival Crockpot that came with the little dipper crock. I can fit a whole chicken in there with veggies and plenty of extra room. I wonder if I should just do it for less time and that would work? I find that soups (tho those are normally larger in quantity) with ground beef work well. Well, anything with ground beef works well (did your veggie beef soup with barley and that was awesome!) Chicken with the bone in like legs and thighs don’t get dry as easily. I’ve done the “chicken in a pot” recipe from the Fix it and Forget cookbook, but I don’t like the texture the chicken got. Your recipe here didn’t have that same texture that my family don’t like. The texture was fine, just on the dry side. I guess the trial and error is the best way to go. What size crock pot/slow cooker would this recipe be for? I have a 2qt one. would I have to modify? Marlene, you might be able to fit it in a 2 qt crock, especially if you cut back on the amount of chicken. Mine is a 6qt. size, but it isn’t nearly full when I make this recipe. Awesome!! thank you so much! your site has been a real time saver and such a great resource for wonderful simply yet great meals!! Crockpot Cantonese Chicken , Verdict : YEAH BABY !!! Elise, I’m glad you liked it. I think it’s time for me to make this one again. It’s been a while since we had it. Ruth, I’m not sure why it printed like that. You can choose to not have it print the photos though. Christi, sorry it was bland. It is a bit blander than other recipes. I think I need to do an update of this one and add a few things. Putting that on my to-do list! Thank you for your website! 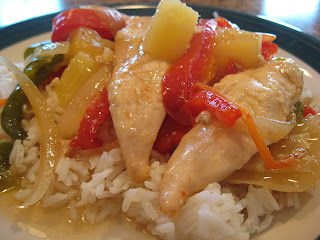 I found you based on this sweet & sour chicken recipe in crockpot — which is what I was searching for. Then I browsed your other recipes and found that you have “normal” recipes that are easy to make! Perfect for a busy mom! Also, I really like how I can print the recipes very easily. This will help me to get my meal plan more organized and give me simple recipe ideas that are not overwhelming. Made this yesterday. Thought it was good. But I think next time I will wait and add the peppers an hour or two before it finishes. Prefer my peppers on the crispier side. Also needed to add more cornstarch as the sauce was too thin.